The “Free Hugs” campaign started seven years ago. It was a simple movement spearheaded by Juan Mann. One person helps another person in the most basic way. A hug. It’s about making a difference in someone else’s life. Be a hero for that person in that moment. Cause I don’t care who you are and how tough you think you are. We all have days where a hug, even if from a stranger, is just what we need. First of all, let’s define compassion in a flexible but precise manner. Makes sense, right? Pretty simple concept, just don’t confuse it with sympathy which is characterised by pity and sorrow while being less action-oriented. Let’s face it – we are self-obsessed beings. Not out of neglect of others or self-absorbed, careless nature. But out of need to care for ourselves. Self-care is the most time-consuming part of our life, but also a necessity that should be most life-giving and fulfilling. But part of taking care of ourselves is taking care of others. As humans, we share a need to support each other in order to further our own survival. It goes back to prehistoric days where tribes relied on the support of each other to continue. The children and the elderly would never last if the strongest group members hoarded food for themselves only. We have a difficult time understanding others on the limited information available to us. Groups make it nearly impossible to identify suffering and take effective action for everyone involved. So instead, let’s focus on individuals. Compassion isn’t about solving others’ problems. They can do that for themselves and it’s healthier for them to do so. But suffering is all around us. We see the headlines in the news every day of chaos occurring in our world. International suffering that leaves us feeling helpless. Sad, gloomy, but true. We can make a difference though. We don’t have to move a nation. Just two lives: our own and another’s. Before you can help others, you need to help yourself. This needs to be your primary goal for your survival and success in life. The steps to compassion are clear and repeatable, but will take time to accomplish and can never be mastered. First comes self-awareness. Come to terms with the suffering you face. What stresses exist? What anger and frustration? Accept that emotion as part of you, at least in this moment. Next, free yourself from this suffering. What is it that drives this emotion? What standard do you set for your own life or others’? What does that standard say about you? Or, what if you don’t meet that standard, what would it say about you? Understand this and let go. Increase your social awareness. We can see the pain in others we interact with. We notice through words used, emotions and attitude, behaviors, and body language. All you need is a hint of suffering, and you can move to the next step. You don’t have to be sure that the other is in pain. You can be wrong and that’s just fine. Be available. Reach out to who you see possibly suffering. Honesty, openness, and a smile makes all the difference. People thrive in safe, judgement free environments. If you can provide that, you are going to connect with someone on a deep level. Share in the suffering. Allow the person to share what they are experiencing and feeling. Do your best to connect them to their feelings, being wary of their discomfort and willingness. Share your own suffering and coping mechanisms. You don’t have to push your methods onto them, but people suffering will often take any advice they can. Continue learning. Learn about yourself and others. Take all you can from your encounters helping others. What works for them that is different for you? What doesn’t? Life is a journey, and so it should be filled with discovery and excitement. I try to use this format for finding compassion in my life every day. At first, the process is scary. We can be terrified of our self-discovery. After we start to see the possibilities, however, excitement builds. Every day becomes a journey of discovery and constant learning and growth. This campaign isn’t just a conversation starter. Every once in a while I am reminded of an inspiring experience in 2007. It was my summer midway through high school. I was 16 years old, and the “Free Hugs” campaign exploded. The video was receiving tens of thousands of views each day and spreading throughout the world. It inspired me to share the compassion that it advocates. And so, I jumped on Craigslist to find someone to make me a cheap FREE HUGS shirt. But I went and waited in the parking lot. A car pulled next to me and a sweet older couple, each in their 70s, waved to me. 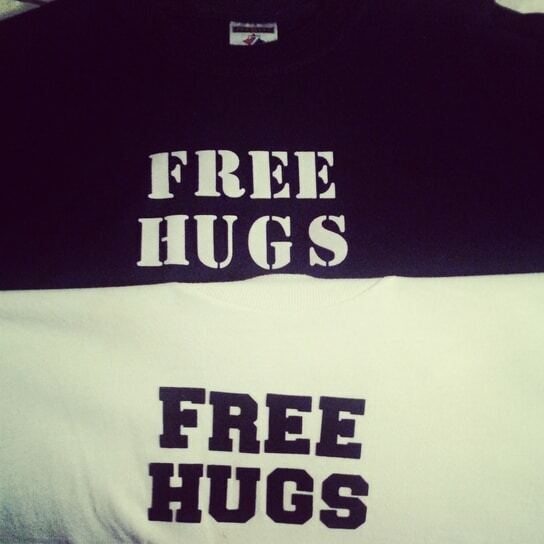 T-shirts I made after being inspired by the Free Hugs campaign. I loved the shirts. Simple, labeled on the front and back, and made their point, just like I wanted. She told me, “You’re going to make someone happy“, and so, she gave me the shirts for free. She spoke from the heart. Her words were honest and packed with wisdom. It’s a simple sentence, and yet it was incredibly powerful. That moment resonates with me still today. This sweet, old woman inspired me for years and absolutely changed my life. With that one line, she taught me compassion. I am eternally grateful for encountering this woman. I have been successful in removing regret from my life, an act of self-compassion. Yet, one regret I have not been able to shake is losing my contact with this woman. I must not have understood her impact at the time, or else I would have found a way to retrieve her email. I just want to tell her that I appreciate her for that moment and that she changed my life. And I want to tell her that I think I am accomplishing what she set out for me to do. Not just through the shirt, but through my interactions with others and my writings. So if you want to “do” compassion, make someone happy.